Rods and Lines: 9 foot, 4and 5 weight rods. An extra rod, reel, or spool may come in handy. Leaders: 9 foot leaders down to 4X, In the clearer water longer and finer leaders and tippets are recommended. 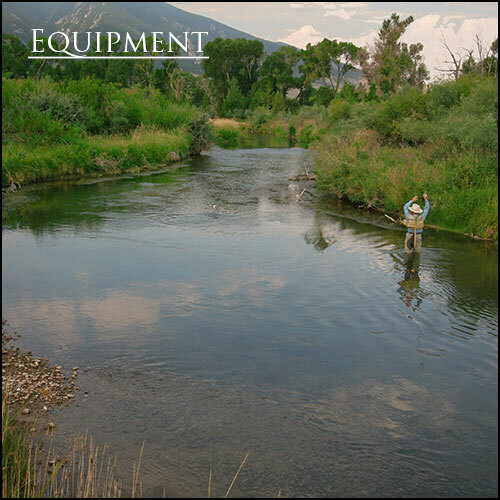 Waders and Boots: Chest waders are recommended during spring time flows. Felt sole boots are a must. We suggest you bring your own equipment that you are comfortable with. We do have equipment for our guests, but highly recommend contacting us before your trip to make sure we have the correct sizes to fit your needs. Flies: Please bring your favorite fly patterns with you. Your favorite fly may hold your secret to fishing these waters. Just incase you need a few extra lucky patterns, we have you covered with one of the largest fly selections in Montana! Plus a wide selection of leaders, tippets, lines and more. Licenses: Montana fishing licenses are available locally. Seasonal Items : No need to bring ties or dressy clothes. Instead bring sunscreen, polarized sunglasses, insect repellant, wide brimmed hat, gloves, a camera, batteries, reading glasses, and your favorite fishing gear.